Additional research provided by Eileen McGrath. The original Alamance Cotton Mill was founded by Edwin M. Holt and William A. Carrigan on Big Alamance Creek near Burlington in 1837, at the site of several small, water-powered operations, including a gristmill and a sawmill. The fourth cotton mill in North Carolina, it became famous as the first southern mill to manufacture dyed, woven cotton cloth. Thomas M. Holt, Edwin Holt's second son, learned the basic techniques of cotton dyeing from an itinerant French dyer in the 1850s and later learned more advanced techniques from a Philadelphia dyer. Under Thomas Holt's direction, workers at the mill began to dye cotton yarn before weaving it into cloth. In 1853 Holt's mill began producing a woven, dyed cotton cloth called Alamance Plaids, which became the state's best-known textile product in the antebellum period. The Holt family was prominent in the development of North Carolina's textile industry in the nineteenth century. The descendants of Edwin Holt-sons, sons-in-law, nephews, and cousins-transformed Alamance County from a rural community based on agriculture to a series of small villages along the Haw River and its tributaries. After the 1837 establishment of Alamance Mills, family members developed sites at Haw River, Glencoe, Ossipee, Saxapahaw, and Graham over the next 45 years. In addition to rural mill sites, the Holt family also developed five mills between 1883 and 1893 in the Company Shops area, which became the city of Burlington in 1887. 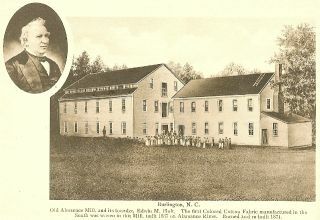 The original Alamance Mill burned in 1871 but was rebuilt and remained part of the Holt family enterprises until 1927, when it was sold to John Shoffner to become the Standard Hosiery Mill. Thomas M. Holt, the most notable of Holt's sons, became the proprietor of Granite Mills in Haw River and the governor of North Carolina from 1891 to 1893. Bess Beatty, Alamance: The Holt Family and Industrialization in a North Carolina County, 1837-1900 (1999). Images courtesy of Alamance County Historical Museum. http://www.alamancemuseum.org/ (accessed October 3, 2012).